We – Kostas and Frithjof – are the 2 botanists in the team, and we have been trying to assess and capture as much of Ascension’s diversity in terms of seaweeds (macroalgae) as possible during this expedition. Due to a clash of timing with other, similar work in Greece in August, we only came here on Sept. 3, but we are also staying about 9 days longer than the other team members. 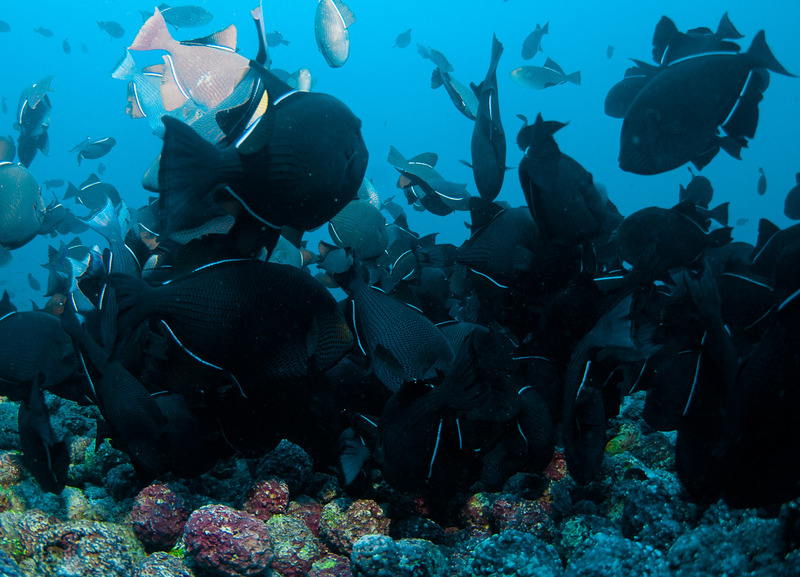 The first thing that strikes any diver is that Ascension has a heavily fish-dominated coastal marine ecosystem. Most of the seabed looks rocky without any seaweeds. So where are the algae? Well, there must be algae in the system – they ultimately produce the biomass and energy to sustain this impressive abundance of animal life. It is not clear at the current time what respective contributions benthic and planktonic algae make to sustaining the coastal marine food web, but it is obvious that the turnover of algal biomass in either case has to be very high. In other words, they probably grow very fast, and they also get eaten (grazed) very fast. The most common fish species around Ascension is the black triggerfish, which is omnivorous – which means that it also grazes most types of fleshy seaweeds. This species is clearly one of the main suspects for grazing most seaweeds to (almost) invisibility. 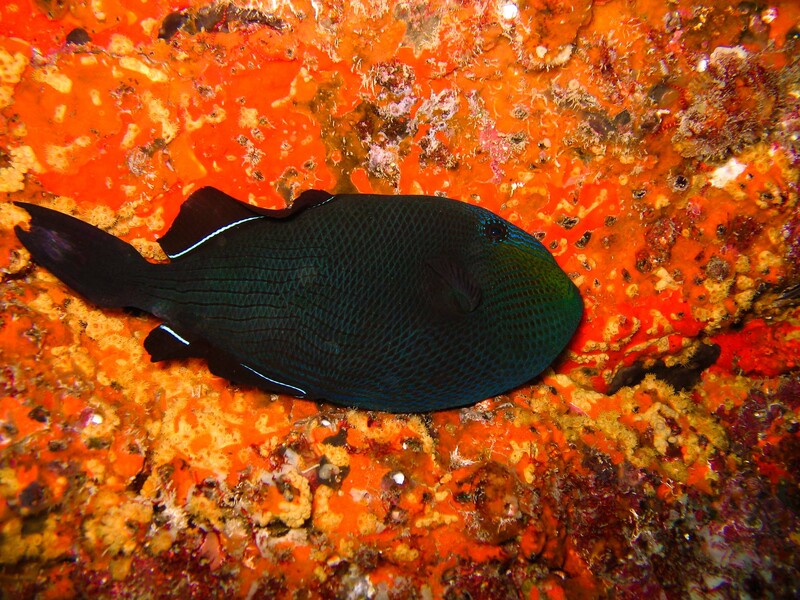 [caption id="attachment_666" align="aligncenter" width="584"] Sleeping black triggerfish. Still, despite the voracious triggerfish, we found a rather rich seaweed flora, just over 70 species in about 2 weeks of intense searching and collecting, including almost 20 new, previously unrecorded taxa. Most of them are either very small (in the open sea around Ascension) due to the strong grazing pressure, typically occurring in small turf-like mats. Larger seaweeds can only be found in places were grazers can’t fully exert their pressure – in particular, in intertidal rock pools and in swell zones. 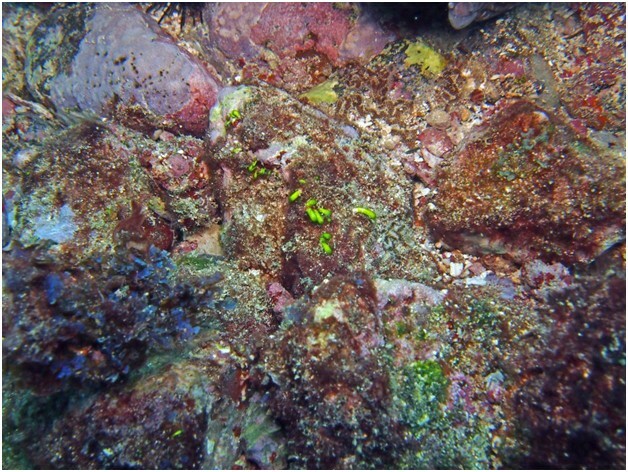 [caption id="attachment_667" align="aligncenter" width="628"] The green alga Neomerys in a coralline community. 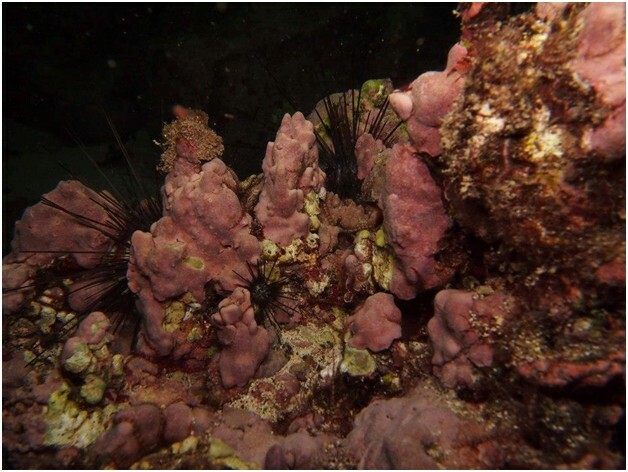 There is one exception to the above – calcareous red algae (coralline red algae) actually dominate much of Ascension’s seabed ecosystem, covering large surfaces and constituting structuring elements to the seabed communities and landscape. Due to their solid calcium carbonate skeleton, they are unpalatable to grazers, and they somewhat fulfil the reef-building role that corals play in many other tropical marine areas around the world. They either form loose piles on the seabed (maerl - rhodoliths), or beautiful, tower- or coral-like, reef-forming structures. Corals have indeed a very cryptic existence around Ascension, and it is not clear to date why that is the case. There are only few experts for coralline red algae in the world (neither of the 2 of us are). We will join forces with two of them, Rafael Riosmena-Rodriguez in Mexico and A. Athanasiadis in Sweden, for identifying the many samples of coralline red algae collected during our dives. Time and facilities during expeditions like this one are always severely limiting factors. In other words, a visiting investigator may easily miss some of the algal biodiversity in a place like Ascension either because it is too small, or outside its growing season. For this reason, we have collected many substratum samples (fragments of sea shells, sand, coralline red algae) in sterile tubes which will be incubated under suitable culture conditions in the laboratory of Frithjof’s friend Akira Peters in Roscoff. Over the following months, Akira will monitor them for algal outgrowth and obtain unialgal isolates (i.e. only one algal strain at a time). By experience, this approach captures a number of taxa usually inaccessible or unavailable during the fieldwork. Our list of around 70 macroalgal taxa around Ascension may still get longer for a while after returning to Europe! Hellenic Centre for Marine Research (HCMR), Greece. Konstantinos (Kostas) Tsiamis is a biologist, focusing on biological oceanography. He has recently gained his PhD diploma in the Biology Department of Athens University, specializing on macroalgae taxonomy and ecology. 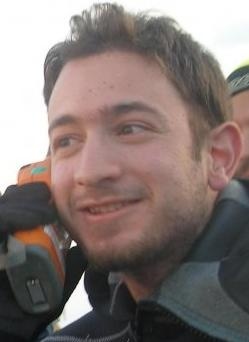 Currently, he is a Post-Doc researcher in the Hellenic Centre for Marine Research (HCMR, Greece). Over the past 9 years, he has been studying phycology, focusing on marine macrophytes: seaweeds (green, brown and red macroalgae) and seagrasses. Their biology, ecology, taxonomy and systematics are the main fields of his research. His PhD-thesis focused on alien marine macroalgae off the Greek coasts, with special interest in their taxonomy and impact to the indigenous flora. In addition, studies of pollution impacts to marine vegetation as well as coastal management are also included in his research topics. 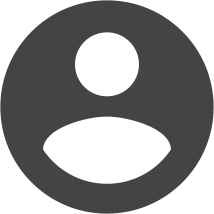 Within the framework of this project in Ascension, his primary research target will be to establish an inventory of Ascension’s seaweed flora. He will be working together with Prof. Frithjof Kuepper. Together, they have done similar phycological exhibitions during the last 3 years in several areas of Greece and Cyprus.